Sometimes, when the pressure is on, one does their best work. This doesn't really apply to me but I thought I'd bring it up because I find it to be an interesting fact. Tonight I had 15 minutes to put together dinner before picking up Jen at the train station. That meant I had to kick it into SUPER PREP MODE, a state only previously achieved during extremely stressful days when working in restaurants. Achieving SUPER PREP MODE while at home and only cooking for two is overdoing it a bit but it does make for a speedy dinner. 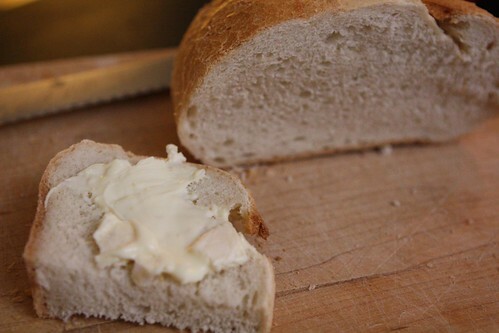 I started off by putting out some Italian bread with some St. Angel which I'd purchased for Jen since it's delicious and pasteurized therefore meeting the criteria of every alarmist study on eating during pregnancy that we have come across. In a pan I browned up some garlic with butter and olive oil, threw in some shallots, Yukon Gold potatoes, and tossed in some chicken then threw it into the oven with a little rosemary on top. 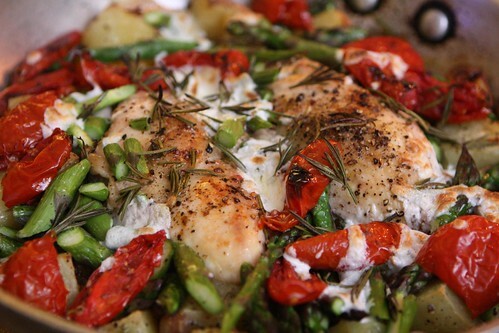 After dashing out to pick up Jen I returned home, threw in some chopped New Jersey asparagus, roasted Divina tomatoes, mozzarella, and a little more rosemary before tossing it under the broiler to brown. This was a hasty but happy dish, one that can only happen when one is in an extreme rush. I'd recommend it as a nice spring dish for early in the season where it is still chilly at night. 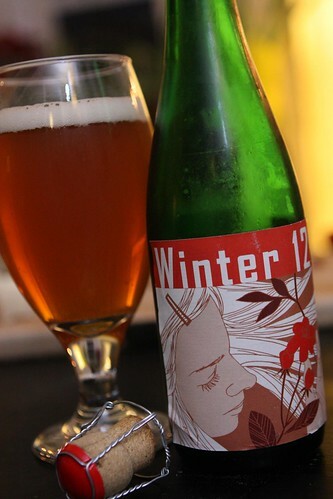 For a drink I opened up the last of Jen's Valentine's gifts, this Winter 12 from Hof Ten Dormaal in Belgium. This was a fantastic beer with just the right amount of Belgiany goodness and a great floral taste. I thought it had the taste of fresh flower petals from the type of hops used until I found out from the back of the bottle that there were actual rose petals used in the brewing process, something that Jen had told me but I had forgotten. I'm not sure why this beer is called Winter. The website, written entirely in the strange language of Belgium, may or may not explain this name but if they are referring to the season I think they have it all wrong. This beer was wonderfully refreshing but it is odd to be refreshed when it is 49 degrees out. I would love to have this beer again on a hot day in mid-summer. Maybe in Belgium summer is actually called winter! It's brewed using rose petals for God's sake. There is most likely a great warning notice on the web site in Flemish, "Don't worry about what this beer is called, be very concerned that it brewed using rose petals!" Ahh, the great closed-minded bear has arisen from his long winter hibernation!